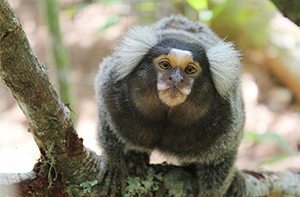 You can help NAPSA continue its important work strengthening its member sanctuaries and advocating for primate retirement. NAPSA is a fiscally sponsored project of Community Initiatives, an Oakland, CA-based 501(c)(3) nonprofit organization. We rely on additional donations from the public to help offset the costs of our primate rescues, educational programs, and outreach initiatives. 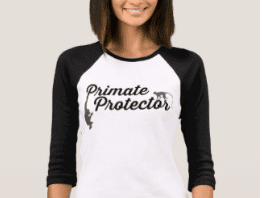 Please consider contributing so we may continue uniting the primate sanctuary and animal welfare communities. NAPSA is excited to now offer individuals the chance to become a NAPSA Friend and link up with the NAPSA community! 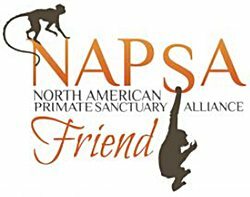 Anyone may become a NAPSA Friend, even if they are not affiliated with a primate sanctuary. Have the chance to support our important work! Complete a donation of $50 or more, and simply select ‘NAPSA Friend’ in the Donation Designation dropdown box. *Workshop registration discount may not be combined with other discounts. NAPSA is excited to partner with Zazzle.com to create an online store specific to NAPSA products. A percentage of all sales come directly back to NAPSA.